Are you looking to add some color and flair to your classroom or an upcoming party? 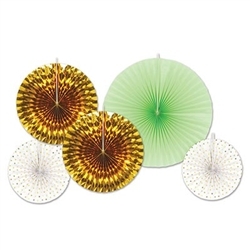 Then these Assorted Decorative Fans are for you! There are five (5) pieces in this package, including two white fans with gold foil triangles, two gold foil fans and one mint green fan. The sizes of the fans vary from nine inches to 16 inches, giving you plenty of versatility when organizing your classroom, home, or office. You can hang these fans from above or set them on tables. It's up to you! PartyCheap has so many different color combinations of tissue fans, check them all out here!